These are small, fine-cutting files that come in a variety of shapes. They are used on many jobs requiring fine work, such as fitting and shaping of regulator pins. 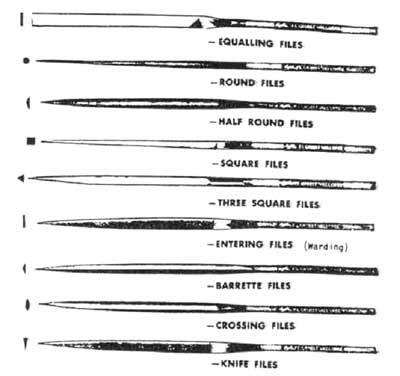 The first five files illustrated are the ones most commonly used by the watchmaker. These are round sticks of Dogwood used for cleaning purposes. They are usually obtained from France. Pegwood comes in three sizes: small, medium and large. The last is usually called ”clock pegwood” because its main use is for clock work. The medium size is more commonly used by the watchmaker. The smallest size is handy for tiny bracelet watches. Pegwood can be sharpened to a point like a pencil. It is used in cleaning to reach hard-to-get-at places, such as pinion leaves. It can also be wet with naptha and used to peg out pivot or jewel holes. Cut to size, it can serve the beginner as a jewel pusher. A soft, sap-free wood from the center of Elder tree branches. The watchmaker finds many uses for it. The sponge-like nature of the wood allows delicate parts to be pushed into it without damage. One use, therefore, is to clean oil from pivots before inspection. Another is to hold wheels, pinions and staffs while they are being measured or examined. Fine pointed tools, watch hands, and so forth. can also be stuck into pithwood for safekeeping. A compound which may be used to refinish luminous hands. The mixture has a wax base and. comes in a paste form. It is applied to the hands with a metal applicator, which has been warmed: and dipped into the pan of paint. The heat causes a small amount of paint to stick to the applicator and melts the paint enough to flow it onto the hand while still warm. If the result is uneven, it may be trimmed with a knife blade.